Staying abreast of the latest trends, new ideas or updates in the genealogy field can be a daunting task this time of year. For most people, myself included, you find yourself overbooked and overextended with the holidays right around the corner. However, staying up to date on the newest, latest and greatest thing doesn’t have to be difficult when you let the genealogy librarians be your guide. Sit back and focus on the turkey, and your family, while perusing this short list we’ve put together featuring some things you need to know. Access to Adoption Records – As mentioned in an earlier blog, adoption records will be available to some adoptees on July 1, 2018. If you or someone you know would like to access adoption records or original birth certificates you should read the earlier post. You should also consult the Indiana Adoptee Network which advocates for adoptees and open access. They have a great website with additional information about obtaining an original birth certificate. Family Search Microfilm Borrowing Ends – Family Search has ended its lending/borrowing of microfilm to affiliate libraries, but trust us this is a good thing. Family Search has made it a priority to digitize as many records as possible and is moving forward to this end by converting the microfilms to digitized records. What was once available only on microfilm is now being put online. The Indiana State Library (ISL) is an affiliate library and this status now allows our patrons to have microfilm sent here to be viewed on our microfilm readers. We still maintain affiliate status and now records that are digitized, but only viewable in family history centers, can be viewed here at ISL online. DNA Interest Group – You may have noticed TV commercials and advertisements for Ancestry DNA kits or 23 and Me kits. DNA genealogy has become extremely popular lately. This topic is in demand and the genealogy division purchased several new titles about DNA and genealogy. Stop in a check out our latest titles on the topic. If you want some in depth answers visit a local group of DNA experts who inform and educate patrons about DNA kits and genealogy, Central Indiana DNA Interest (CIDIG). CIDIG meets at the Hamilton East Public Library- Fishers Library and is a great resource for those with questions or interest in DNA genealogy. 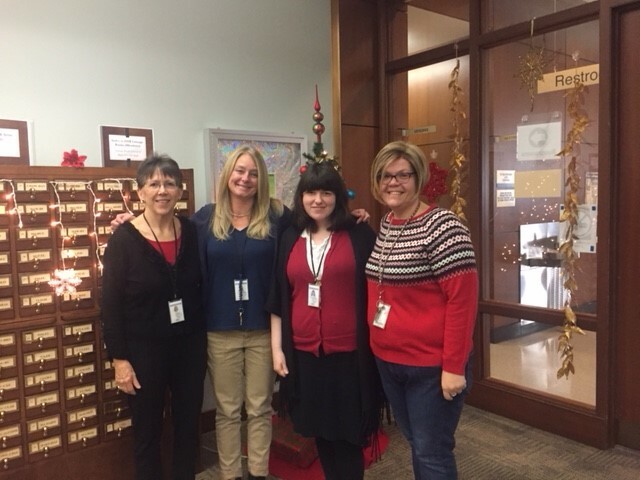 Happy Holidays – The Genealogy Division staff of the Indiana State Library would like to wish you a Merry Christmas and happy holidays. Please note that we will be closed Monday Dec. 25 and Tuesday Dec. 26, 2017. The library will re-open Wednesday Dec. 27, 2017. The friendly Genealogy division staff. This blog post was written by Crystal Ward, librarian in the Genealogy Division. If you would like more information, please contact the genealogy department at (317) 232-3689.